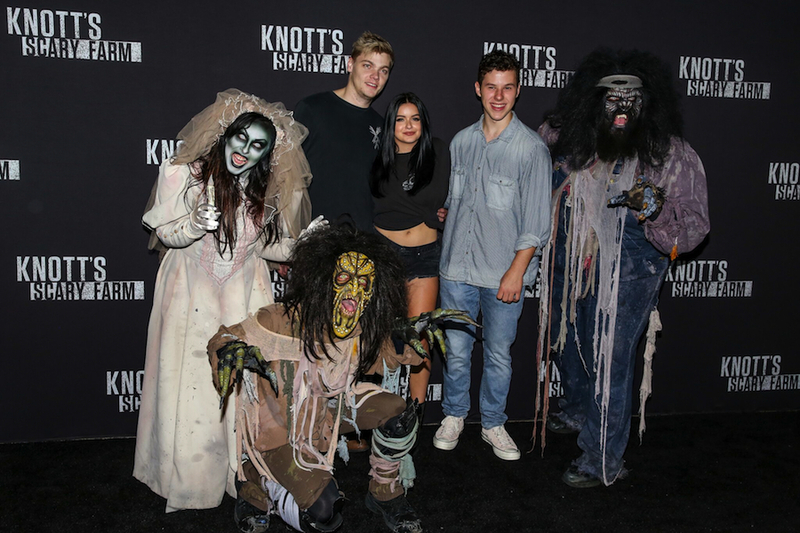 Vanessa Hudgens, Ariel Winter, and More Kick Off Halloween at Knott's Scary Farm! Everyone in California knows of Knott’s Berry Farm, and this time of year it’s especially worth knowing about when the 160-acre amusement park completely transforms just in time for Halloween. 2017 marks its 45th Knott's Scary Farm Halloween celebration, and the elaborate seasonal theme will run for 25 nights ending on October 31st. Visitors will be delighted to find 13 uniquely haunted houses, mazes, attractions, sinister shows, and far more that will surely awaken the autumnal Halloween spirit in everyone! Along with it being a landmark year, the amusement park will also be debuting three all-new, unique haunted attractions that will surely instill fear in even the most unfazed guests! Don’t expect cheap animatronics here… there are real-life individuals whose sole purpose is to terrify you. Dressed up as monsters, they roamed the celebrity-packed Black Carpet on opening night and set out to scare everyone, including the press. 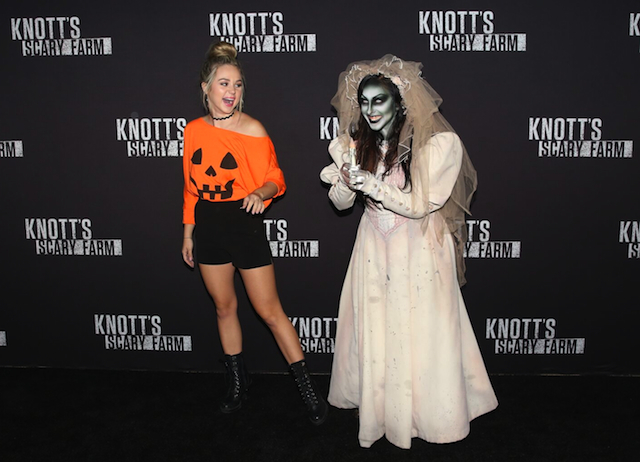 Stars who attended include the Queen of Halloween herself, Vanessa Hudgens, as well as Bella Thorne (who has an upcoming Halloween movie, The Babysitter, coming out soon), Kellan Lutz, Ariel Winter, Travis Barker, Maddie Ziegler, Britt Robertson, Sofia Carson, Sasha Pieterse, and countless more eager to get their scare on. 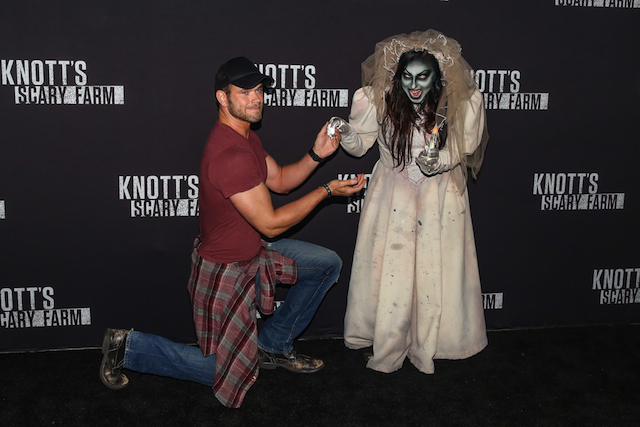 The aphorism of Knott’s Scary Farm is “Where Nightmares Never End”, and I can more than vouch for this statement since I made sure to check out the venue this for their Instagram event and was enthralled (and terrified) by what I experienced. Needless to say, I cannot wait to go back. The park truly outdid itself and made sure that even the smallest of details, such as different colored contact lenses and costumes for the spooking actors, were on-point. From a culinary standpoint, the evening did not disappoint either with desserts such as Frankenstein heads, topped with whipped cream and filled with blackberries, being served. The visit to Knott’s Scary Farm certainly helped me kick off the Halloween season in an appropriate fashion and will for you too!